Be the first to hear about their new releases and deals. Download the Booksprout app and search for D.D. Lorenzo today! From childhood, author D.D. Lorenzo has been more an empath than she cared to be. Sensing the emotional connections between family and friends, she wrote her first story when she was six years old. 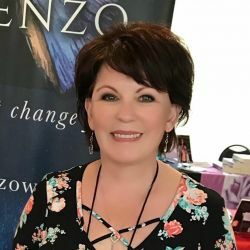 The gift continued into adulthood and with the encouragement of a few New York Times Bestselling Authors, she took a leap of faith and published. With each day she aspires to be a better storyteller than she was the day before. In her spare time, she loves sinking her toes in the warm sands that border a crystal blue ocean or a peaceful lake. Her tastes are varied and eclectic so you can converse with her about most any topic. There are only two things she doesn't like; judgmental people and okra. You can find DD on Facebook, Instagram, Twitter, Pinterest, and Goodreads.